One of the most valuable and rewarding ways you can help musicians is by volunteering with us. Volunteers contribute to our work in a variety of ways, with commitment levels ranging from one-off event stewarding and fundraising, through to ongoing support for some of the older musicians we help. You will find specific opportunities here and if you'd like to register your interest, please fill in the form below. Alternatively, if you would like to talk to us about how you’d like to help or if you need help filling out this form please email us at volunteer@helpmusicians.org.uk or call 0207 239 9133 (Monday to Friday, 9am to 5:30pm). 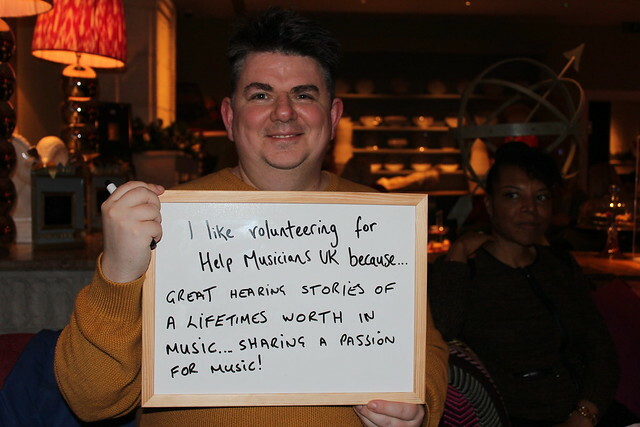 If you’ve got some spare time and would like to raise funds for Help Musicians UK, why not join our volunteer team. There are lots of different roles available in your local community, so please get in touch today! Volunteering can make you feel part of something bigger than yourself, part of a community and give you a real sense of achievement. You will be making a real difference raising awareness for the issues musicians face in such a rewarding yet unstable career. There are several ways you can volunteer with us. You can apply for one of our volunteer roles we are recruiting for or you can apply for one of our one-off volunteering opportunities. Here are some other reasons why you might choose to volunteer with us. “Our volunteer visitors are all different, what they have in common is a love of music and a boundless enthusiasm for giving their time to musicians.” Angela Riches-Heed, Senior Regional Officer. Volunteer Visitors play a vital role by visiting older musicians in their homes. They provide a listening ear and a reassurance that Help Musicians UK is there to help when needed. For a musician who is socially isolated or has feelings of loneliness, they are able to spend time with volunteers who are genuinely interested in them. For our volunteers, they have the opportunity to meet a fascinating group of people and find out about their lives and careers (plus the odd scandalous anecdote). All our Volunteer Visitors attend a one day training course at our office in King's Cross, where they learn more about our wider work and the key skills needed for visiting. We also cover travel expenses for all visits, and provide ongoing support and guidance to every volunteer. If you would like to find out more about becoming a Volunteer Visitor, please get in touch using the details at the top of the page. We particularly need visitors in the West Midlands, East Sussex, Kent and Thames Valley. We are currently not looking for anymore Volunteer Visitors in London, please check back as this may change in the future. If you are interested in becoming a Volunteer Visitor please read a short blog written by one of our current Volunteer Visitors, Tracy O'Connor. She explains why she volunteers for HMUK and what it means to her.